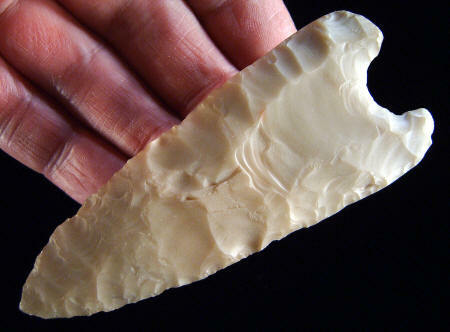 This Clovis point was found in 1962 by heavy equipment operator Donald Colby. He found the point during reservoir construction. The Colby site was later named after Donald Colby, the discoverer of the site. This is the largest complete example. A total of four Clovis points were found on the site. All of the Colby Clovis points have rounded bases. Frison describes this Clovis point: "The specimen found by Colby is noticeably different in outline from the classic Clovis type, and part of this may be the result of reworking. The distal end was reworked for approximately 11 mm probably to correct for a previously broken tip. The blade edges expand continually to within about 8 mm from the base, where they are rounded sharply. A notch 9 mm deep and 15 mm wide is flaked into the base. The blade edges are ground for just over one-third of their length, and this joins with the grinding of the deep basal notch. There is a strong possibility that the base was reworked also and that the original specimen was longer and that it probably broke distal to the hafting. This Clovis point is made of a banded chert that probably came frm the Madison Formation. It measures 3 5/8 inches (9.2 cm) long.